This time we would like to share with you an exceptional find discovered in a very small and almost completely unknown locality in Greece, Kirki area – King Arthur mine. King Arthur mine is a small-scale mine which was operated in the 30’s by English mining company. 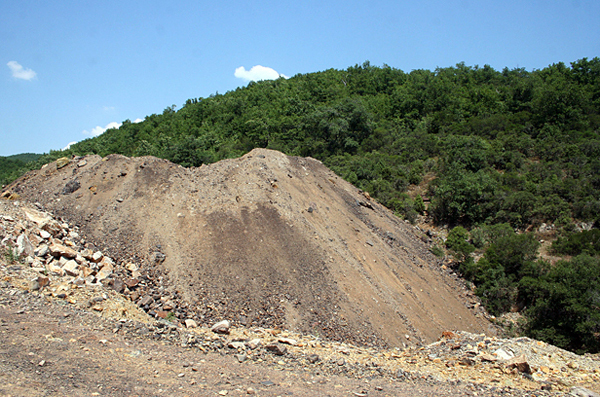 They worked on a complex mineralized sulfide ore veins in the area of Kirki, Evros Prefecture, Thraki, Greece. 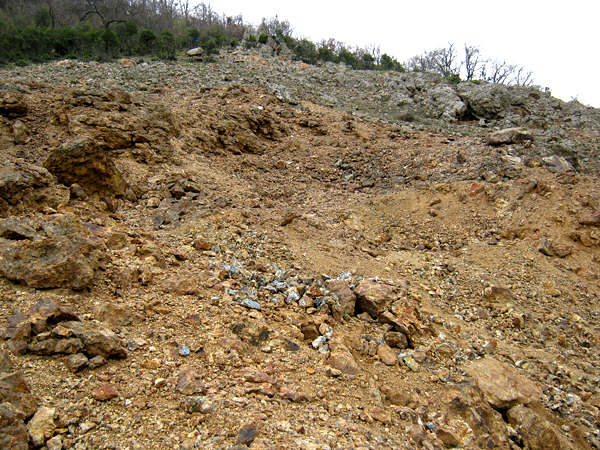 It is one of dozens small scale mines spread in a 40 square km area, generally known as "Kirki mines" thanks to the fact that the most important of these mines – Agios Philippos – is located close to Kirki village, about 20 km NNW of Alexandroupoli, capital of Evros Prefecture. 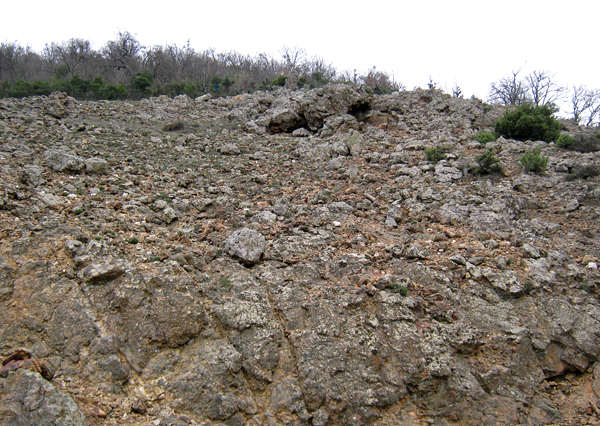 Kirki mines are known for many occurrences of polymetallic mineralization of Oligocene age hosted in clastic sediments and volcanic rocks (andesite, trachyte, rhyolite) of Eocene age. The area is a part of the Kirki-Essimi "primary" basin that was formed by intense tectonic activity during Paleogen and belongs to the SW part of the metamorphic complex of Rhodope massif. 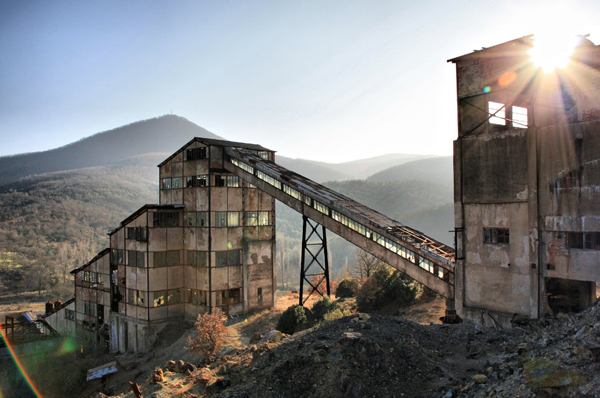 Mining activity in the area (mostly small scale workings) began in 1880 during Turkish occupation and ended in 1980 with the closing of Agios Philippos mine, after collapse of it’s main tunnel around 1977. Beside of Agios Philippos mine, that operated for about 50 years, all of the other mines in the area had very short operating time. 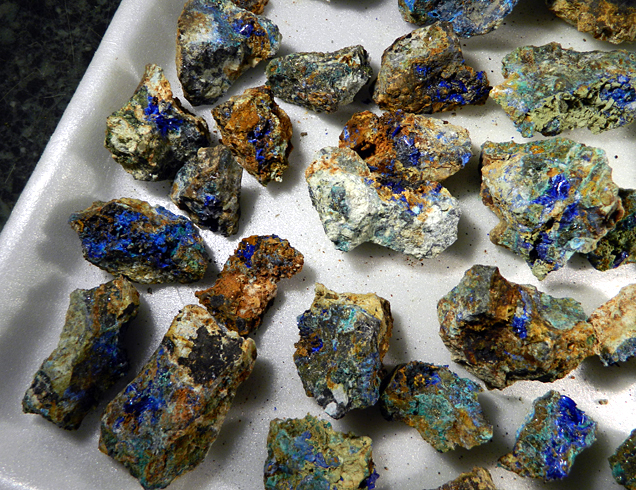 Being small, usually with low quality ore and hard to process, they didn`t last long. King Arthur mine operated from 1936 to 1940 and after closing it was forgotten and "lost" in the forested hills. In 1964 a series of test drill-core sampling and ore analysis was done in the mine by the Institute of Geology and Subsurface Research (old name of today`s Institute of Geological and Mineral Exploration) on behalf of the Greek State. 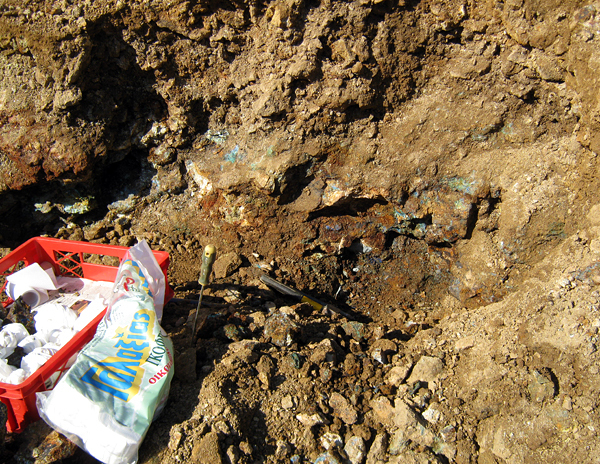 Purpose was to determine the quality and quantity of remaining ore but results were probably disappointing and the mine was never opened again. 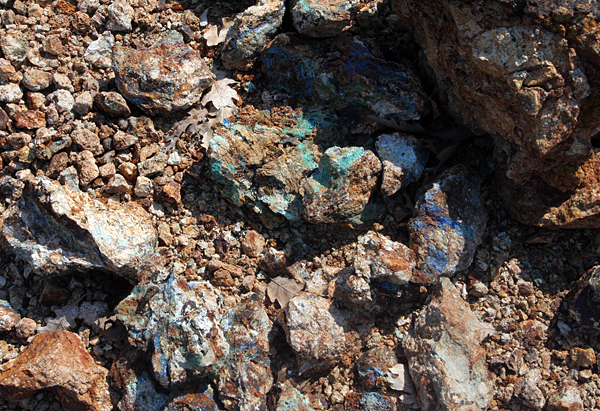 There are almost no mineralogical studies or reports published about this mine. 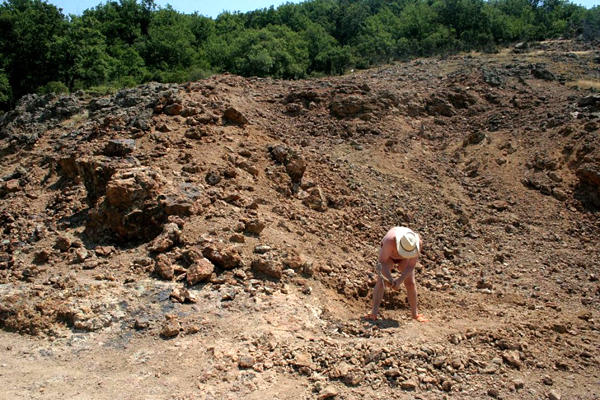 Mineralogical studies in Greece are done usually by geology schools and universities. 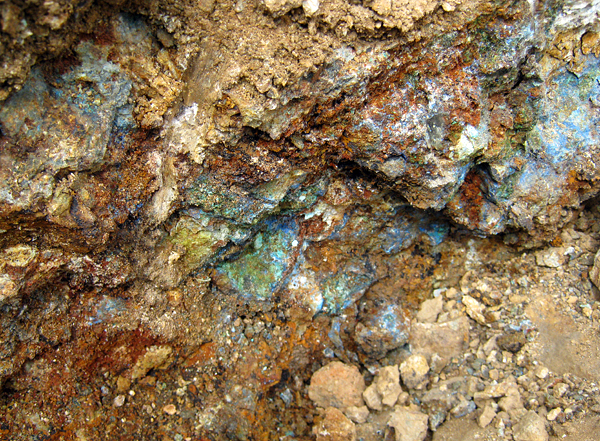 Institute of Geological and Mineral Exploration researches the economically interesting ore bodies and doesn`t give much attention to detailed mineralogy. 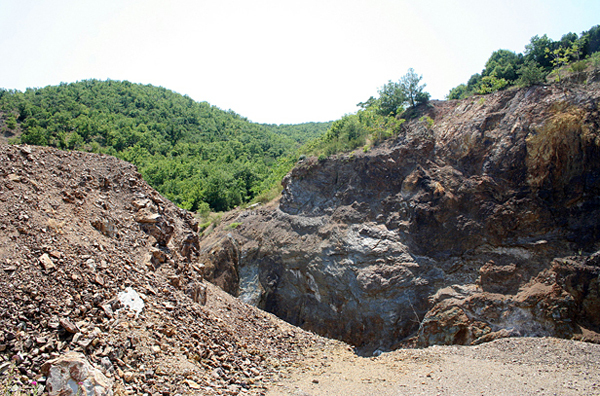 There are dozens of detailed mineralogical studies about Agios Philippos - the mine located in the same area, because it worked for a long time, was much bigger, very easy to find and easily accessible by normal cars. 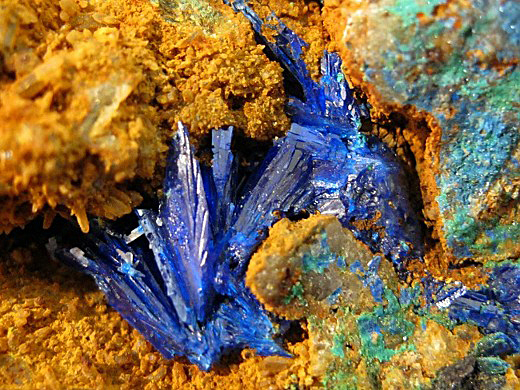 – secondary minerals – linarite, cerussite, brochanthte, anglesite, leadhillite, caledomite, chrysocolla, quartz, goethite, allophane and malachite. 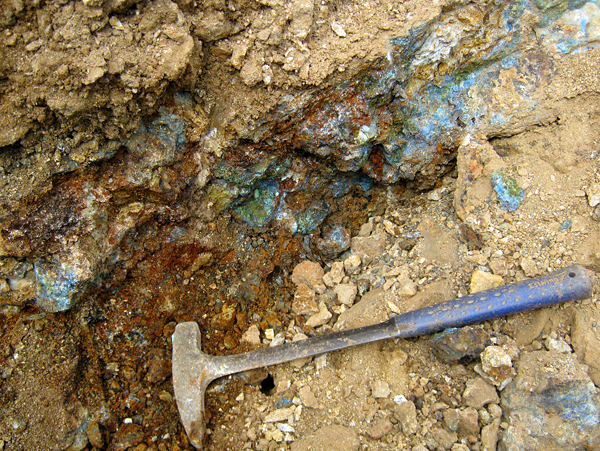 Sulfide minerals are massive and frequently forming matrix for secondary minerals which are much more important from collectors’ point of view. 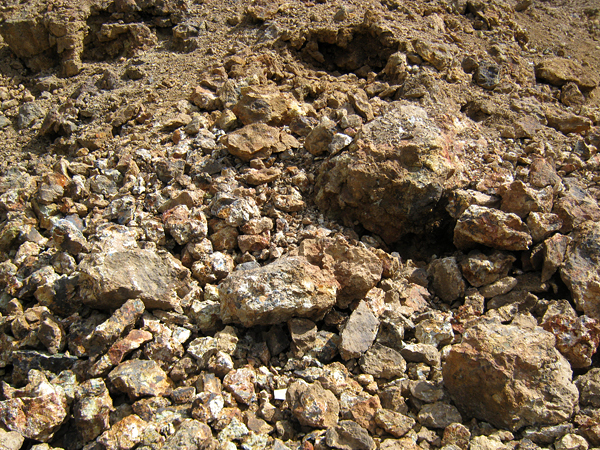 Most common are sphalerite and galena with also abundant pyrite and chalcopyrite. 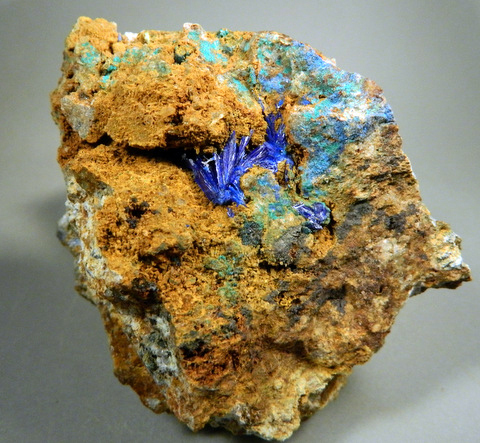 Secondary minerals, growing from changes of the primary sulfides, are much more interesting for collectors and with no doubt linarite is the most important of them. 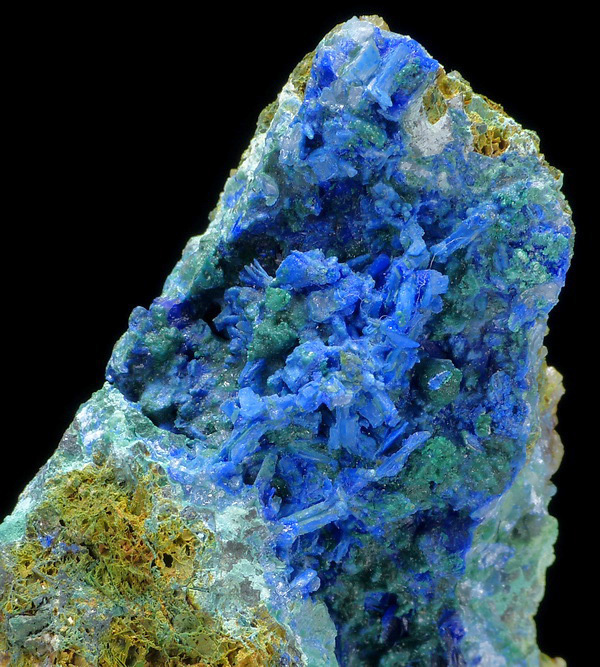 Linarite is formed as beautiful highly lustrous dark blue crystals, size from microcrystals up to 1 cm long, occurring in cavities usually associated with brochanthite (crusts or small spheres) and more rarely with cerussite (crystals from 0,3-1 cm). 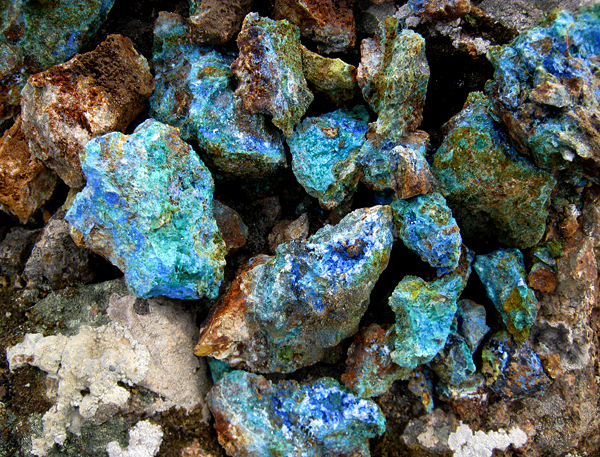 Anglesite and leadhillite are very rarely noticed, usually under magnification. 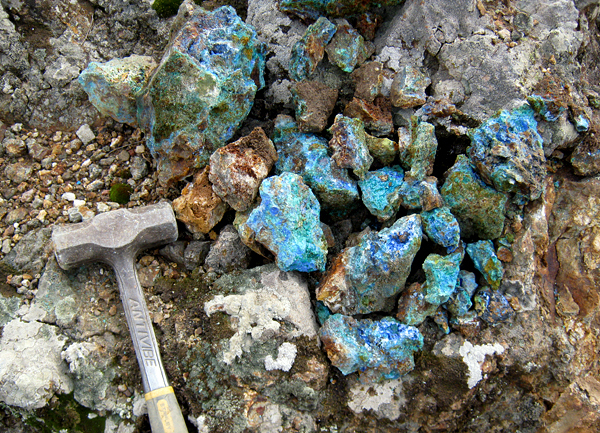 Chrysocolla is quite common, usually occurring as crusts that rarely reach 1 cm thickness. Malachite is quite rare and forms crusts or acicular light green crystals coating small cavities, sometimes associated with white cerussite. 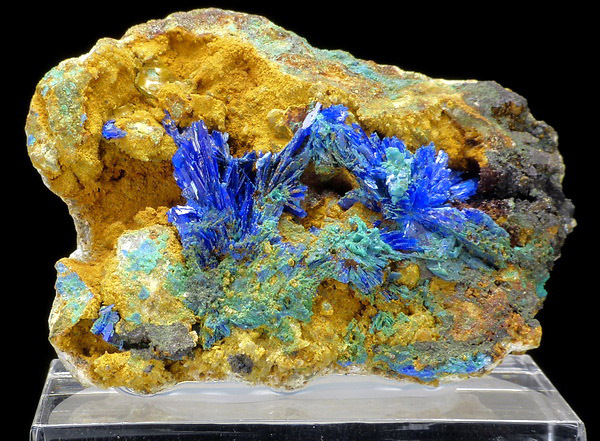 The most rare of all secondary minerals is caledonite with turquoise blue transparent crystals up to 0,5 cm on the best specimens. Recently the mine is very hard to find. 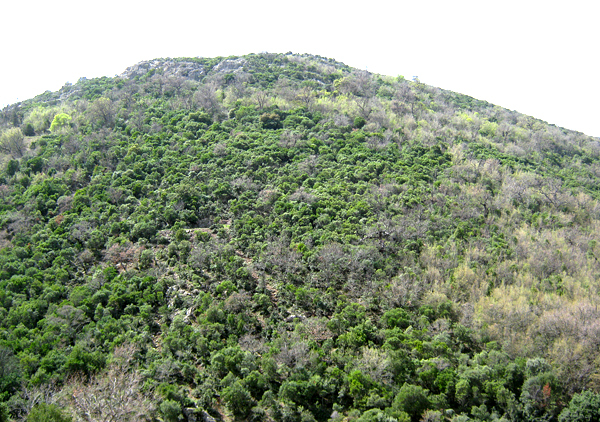 It is small and "lost" in the hilly area. An extensive network of crosscutting forest roads (most of them in bad condition, 4x4 car is necessary) makes access to the mine very difficult. For that reason very few collectors have visited the mine over the years. When I first got there I immediately noticed absence of collecting activity signs. Also I noticed lack of coverage on my cell phone. 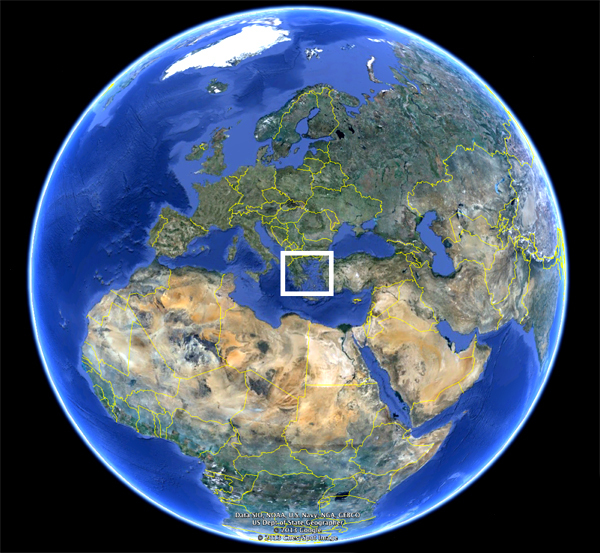 Satellite photo of Earth with marked area shown on next figure. 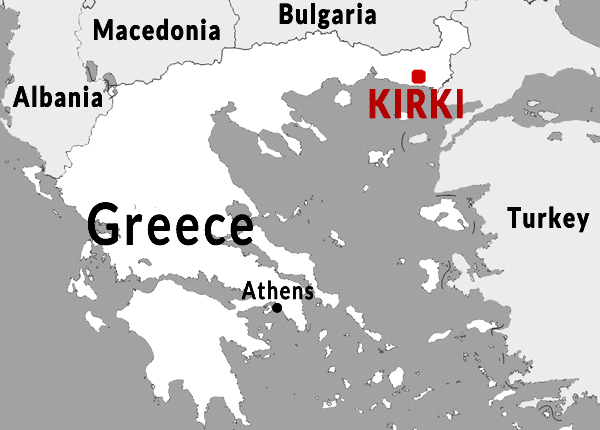 Map of Greece with Kirki area marked. 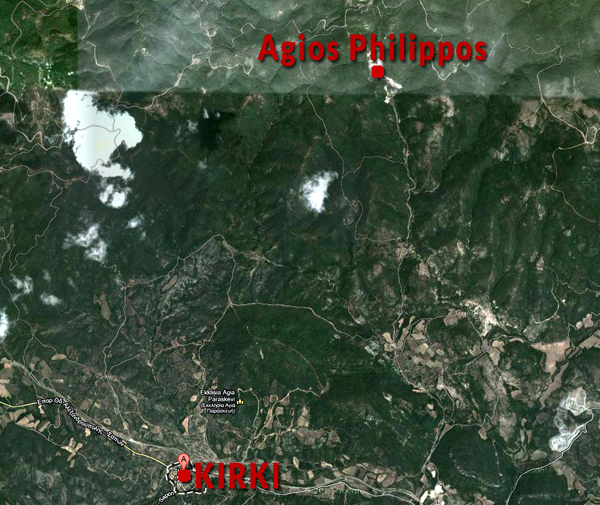 Satellite photo of area between Kirki and Agios Philippos where all mines in the area are located. 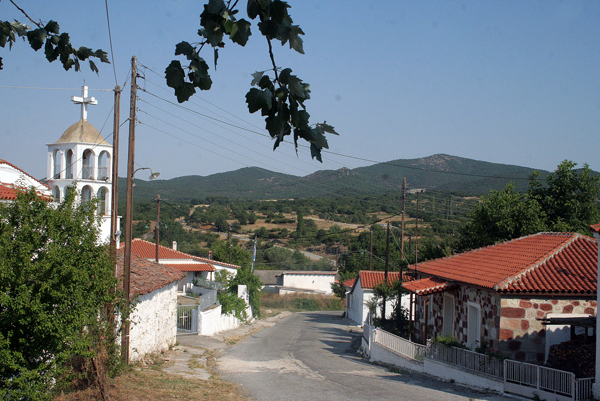 Streets of Kirki village. G. Brandstetter photo. 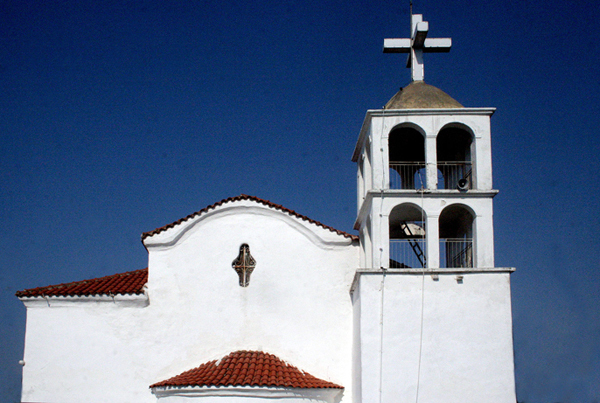 Church in Kirki. G. Brandstetter photo. 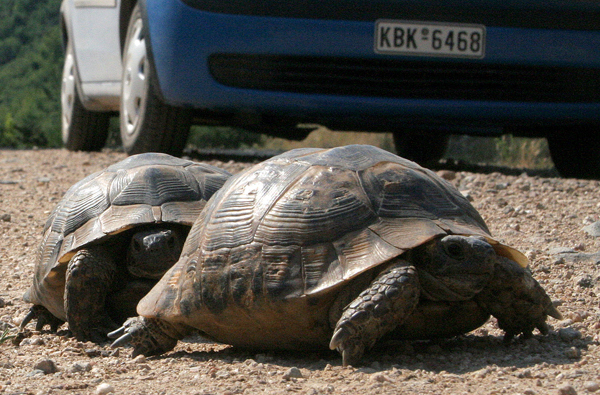 Turtles on the road on the way to the mines. G. Brandstetter photo. 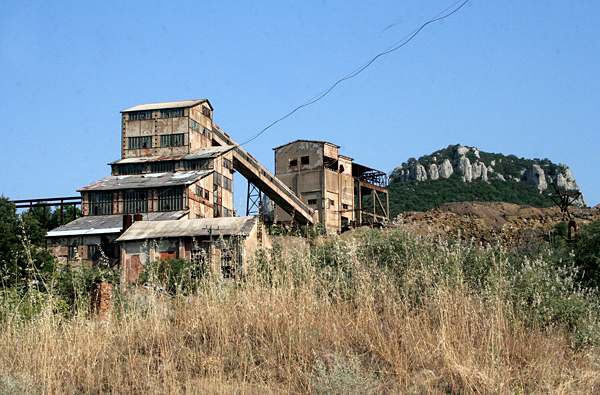 Abandoned industrial buildings, one of traces of mining activity. G. Brandstetter photo. Abandoned industrial buildings, one of traces of mining activity. Old dumps near Kirki. G. Brandstetter photo. One of many workings in Kirki area. G. Brandstetter photo. 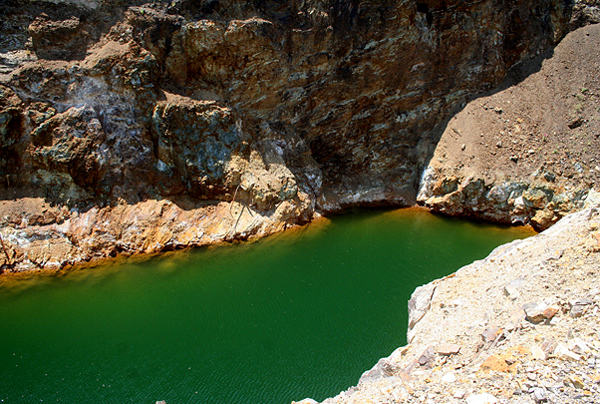 Lake in the old quarry. G. Brandstetter photo. King Arthur mine is very difficoult to find in heavily forested hills. A. Tsinidis photo. 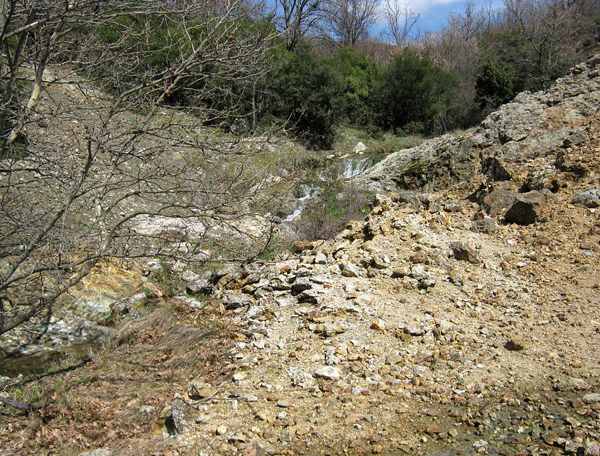 Small creek below King Artur mine. A. Tsinidis photo. View of the area where old entrance to the King Arthur mine is located. A. Tsinidis photo. Old, partly collapsed entrance to the King Arthur mine. A. Tsinidis photo. Main tunnel is full of water and mine is in very bad shape. A. Tsinidis photo. Leftovers of wooden mining constructions sticking up from dupms. A. Tsinidis photo. In August 2006 I spent my holidays on Thassos Island, swimming, visiting historic places and yes - successfully collecting minerals too. By chance i met my collector friend Franz Rittmannsberger from my home mineral club who told me about new finds in Kirki. He got his information from a German collector who visited the mines shortly before him. For me it was a new discovery, I had never heard about it before. I had a car with me, Franz had his plan - we decided to start! Our families stayed in Thassos for swimming. A few hours later we reached the small Village of Kirki. From this moment on I knew I would never find King Arthur mine again ... Several crossings on dusty roads without any signs, some sheep without a shepherd, a small chapel, more dusty crossings and heavy August heat... About 10 km later we found the first mine building, but no minerals. 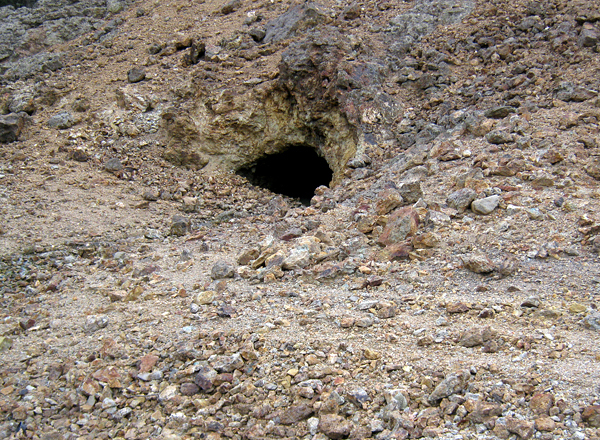 More kilometers, more dusty crossings without signs and finally another mine. Possibly Agios Philippos, but not sure. Luckily finally we found our goal. But where to dig? 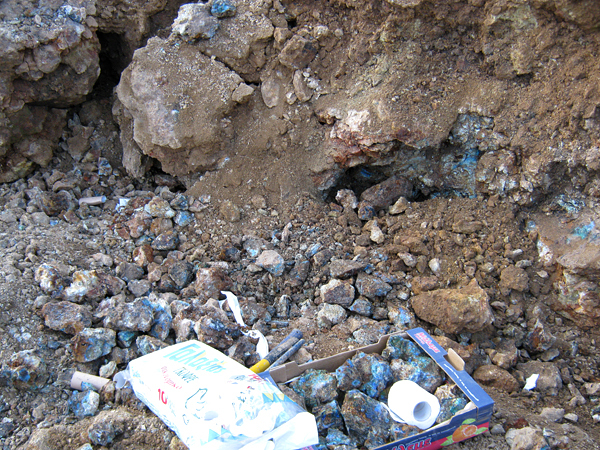 We were lucky- just a few meters from our parking area we found a nice vein with lots of linarite. Mostly massive but also with several cavities. It was stunning –piece after piece filled our boxes. What did we find? 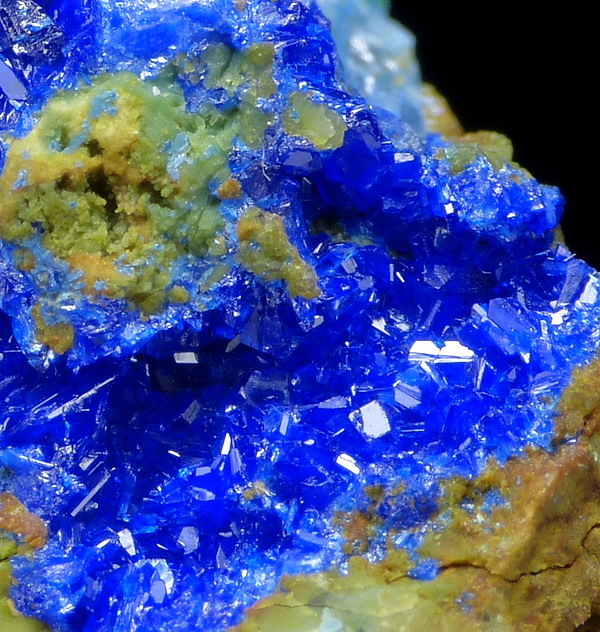 Mainly linarite in crystals up to 2 mm. Not too big, but self collected. What I absolutely loved, was a few samples with snow white cerussite covered with colorful linarite! Also nice was specimen with probably hemimorphite balls covered with crusty linarite and also crusty caledonite. At home, we found more rare species with a binocular. Some very rare caledonite crystals, small but good quality. 1 mm sized leadhillite perfect for micromounters. Some crystals of sulfur, brochantite, anglesite, and finally allophane crusts. I think larger crystals are the result of very hard work, not easy to find for a short visit like we had, so my big respect to all collectors who bring out the good stuff! 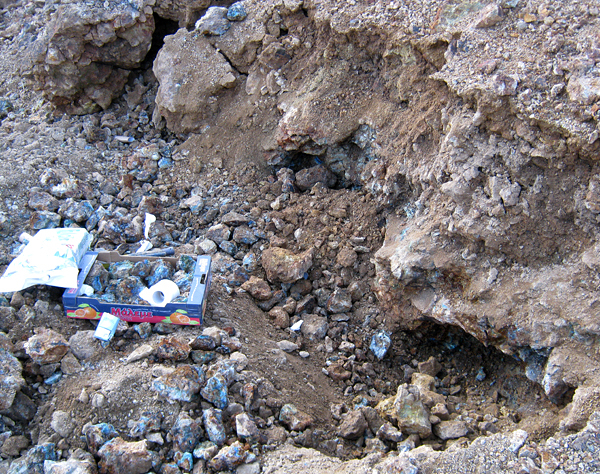 Collecting in King Artur mine area August 2006. G. Brandstetter photo. 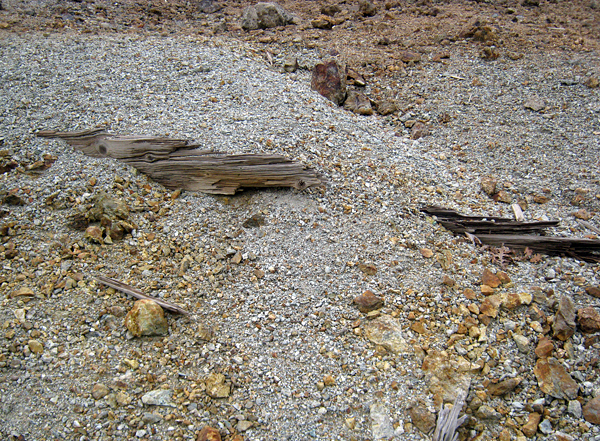 Mineralization visible on the surface in 2006. G. Brandstetter photo. One of the best specimens collected in 2006. G. Brandstetter photo. 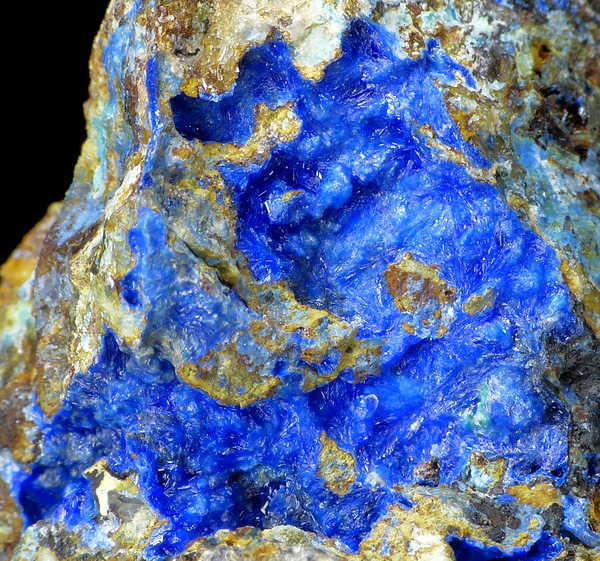 Cerusite with linarite collected in 2006, FOV 2 cm. G. Brandstetter collection and photo. Caledonite collected in 2006, FOV 8 mm. G. Brandstetter collection and photo. First time I visited the mine in early December 2012. 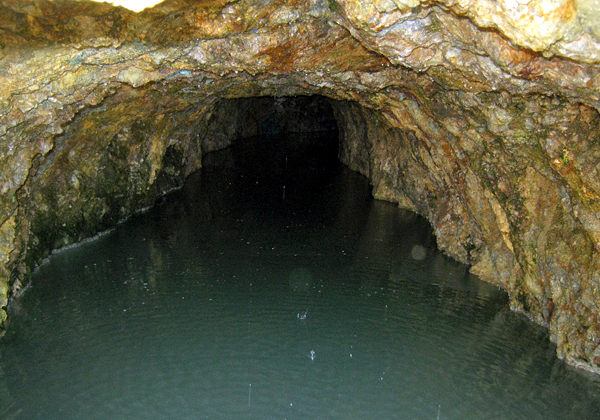 The mine had only one entrance to the tunnel that was completely flooded (water is about 1 m deep, even close to mine exit) and extremely dangerous. 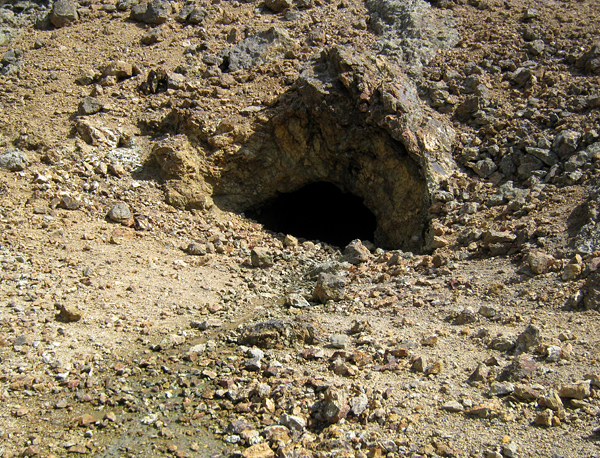 Outside the mine`s entrance there were low dumps of sphalerite-galena-pyrite-chalcopyrite ore heavily weathered by decades of exposure to nature. 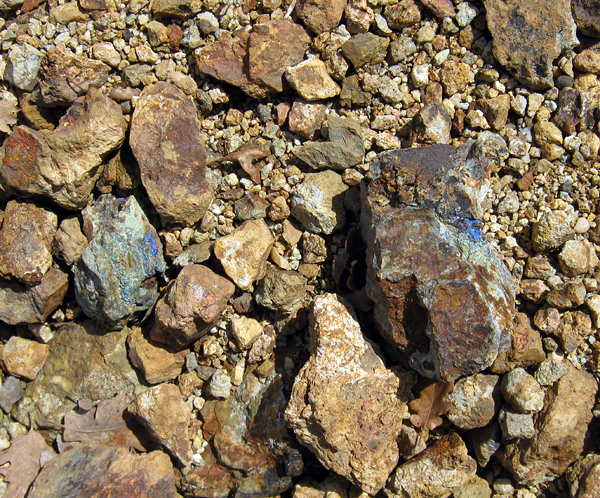 During my first visit it had been raining earlier that day so it was easy to spot signs of sphalerite-galena mineralization mixed with tiny dark blue marks on a rock surface. Breaking hard volcanic rock, the ore vein became wider and the first small cavities of dark blue sparkling linarite crystals came out. 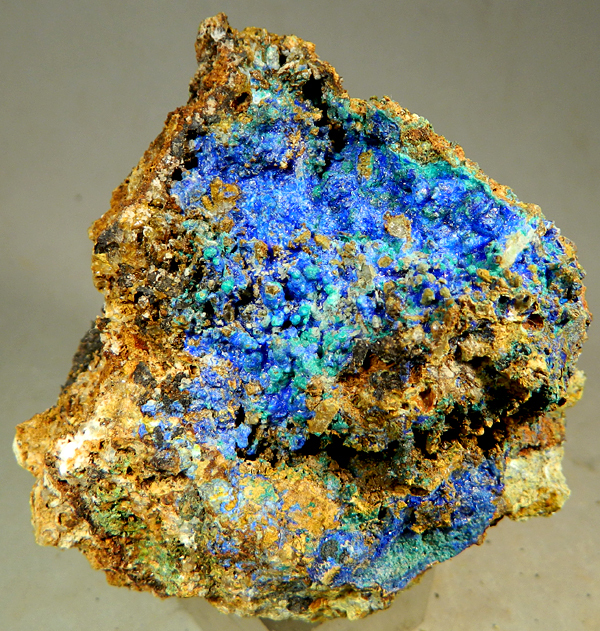 This was the find of an ore lens that turned out to host the finest linarite ever found in Greece. 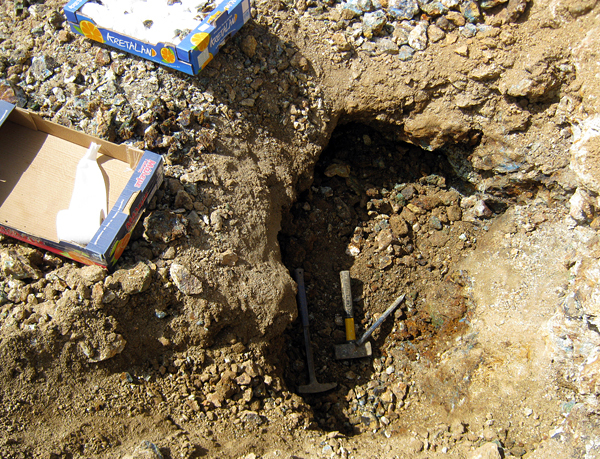 I collected some very fine specimens and planned to return as soon as possible to continue digging. I visited the mine four times more, working in the ore lens that turned out to be 3.5x0.4x0.5 meters big. I managed to collect about 500 specimens from thumbnail to large cabinet size, including 200 of better quality. 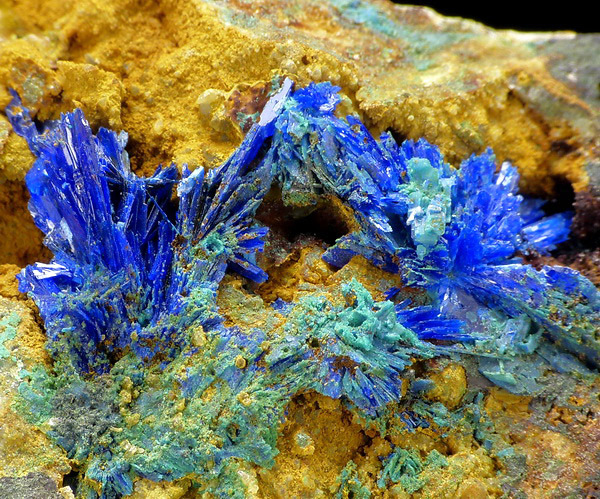 The best of them included linarite crystals from 0.5 to 1 cm long. Some of others had smaller crystals (average 0.5 cm) but nicely grouped or covering cavity walls. In my opinion, the best of all are two specimens being two sides of one small cavity with crystals up to 1 cm associated with a few mm big “snow-flake” cerussite twins. This were the best linarites found ever in Greece with size of crystals far exceeding the best ones found in Lavrion area in Attica. Unfortunately after all my work the lens is exhausted and there is no other visible exposed mineralization on the rocks around the mine. 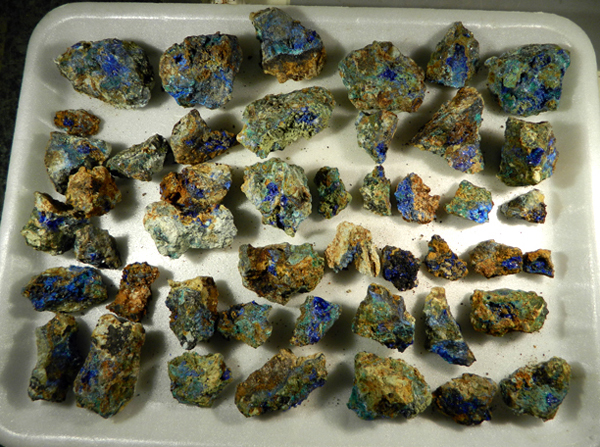 This find was one of the best I ever discovered during my +20 years of specimen prospecting and field collecting. 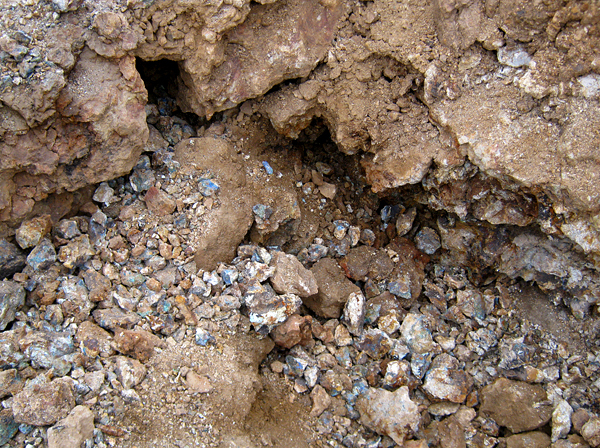 Mineralization visible on the surface in 2012. A. Tsinidis photo. Many of diggings were unsecsfull. A. Tsinidis photo. 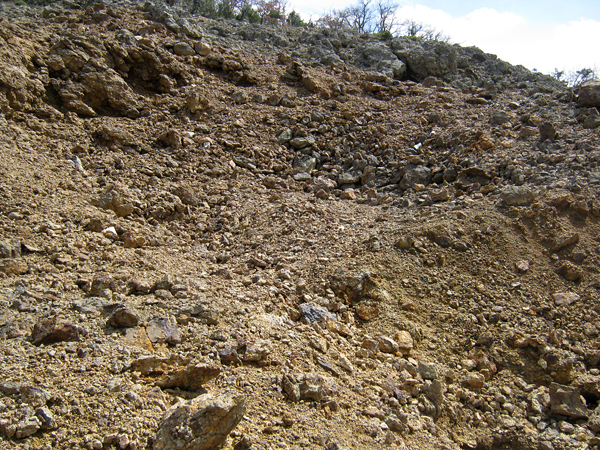 View to the area where the best vein was found in 2012. A. Tsinidis photo. Here it is in situ! First diggings in the vein. A. Tsinidis photo. Excavating the vein. A. Tsinidis photo. 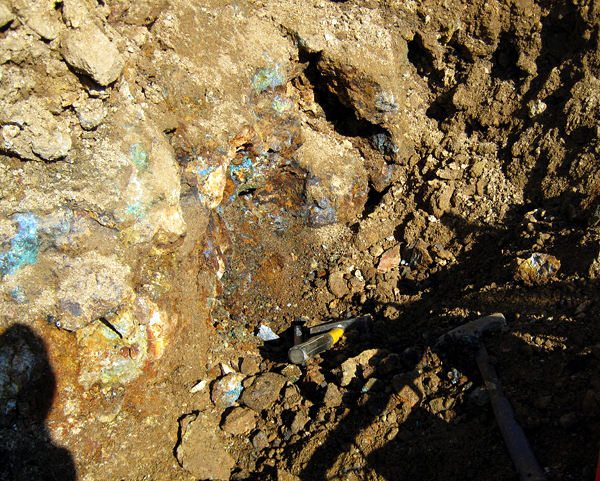 Mineralization is everywhere! A. Tsinidis photo. 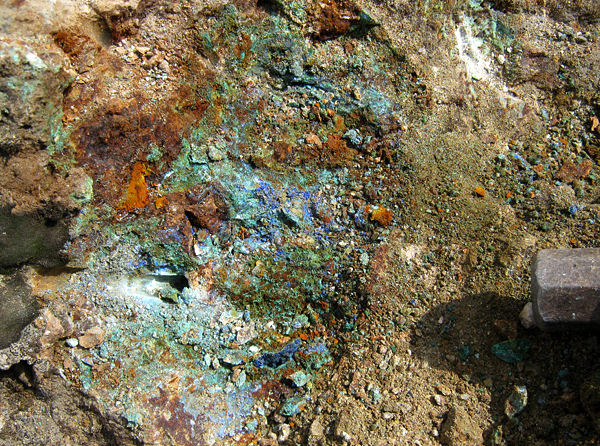 Copper minerals in situ. A. Tsinidis photo. Vein fragments with numerous vugs. A. Tsinidis photo. 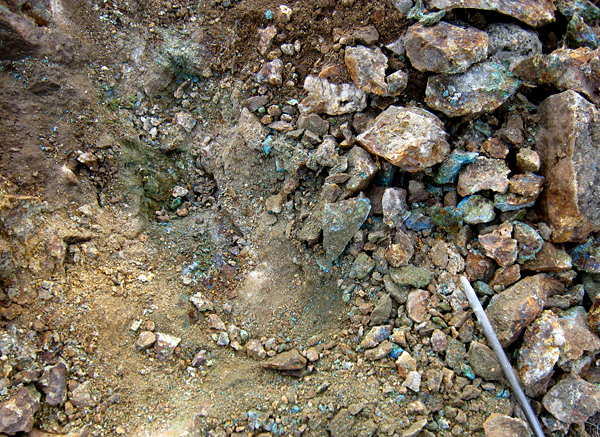 Vein fragments with numerous vugs with linarite and cerussite. A. Tsinidis photo. Freshly collected specimens. A. Tsinidis photo. Freshly collected specimen, still covered with mud. A. Tsinidis photo. 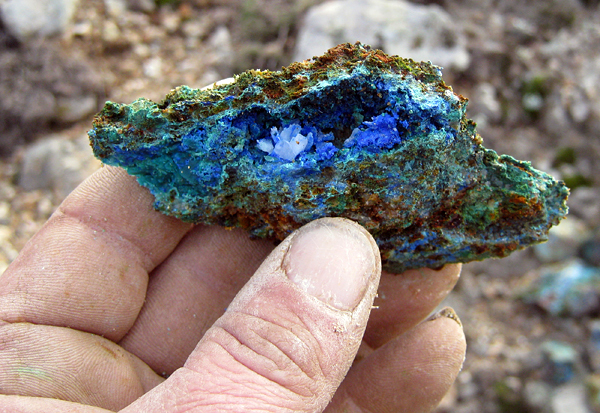 Freshly opened cavity with linarite and cerussite. A. Tsinidis photo. Vein is almost exhausted, last workings in the area. A. Tsinidis photo. That`s over, vein is completely mined out. A. Tsinidis photo. 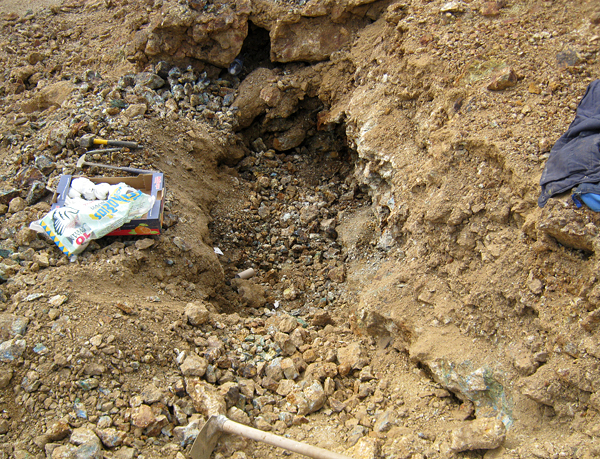 Area of the vein after it was mined out. A. Tsinidis photo. 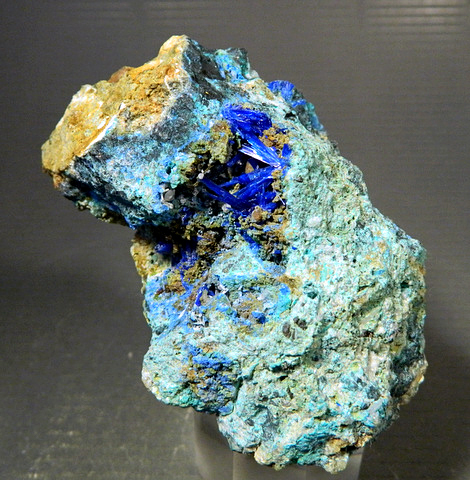 Typical specimen with linarite and brochantite, 7 cm tall. A. Tsinidis photo. 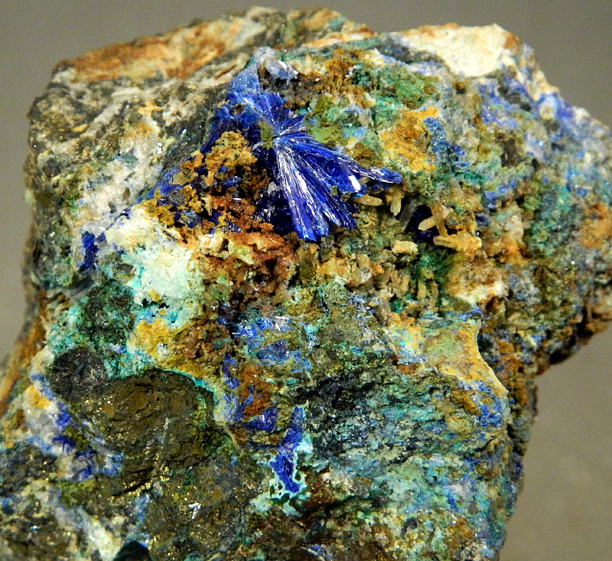 Specimen with great linarite crystals about 1 cm long. A. Tsinidis photo. 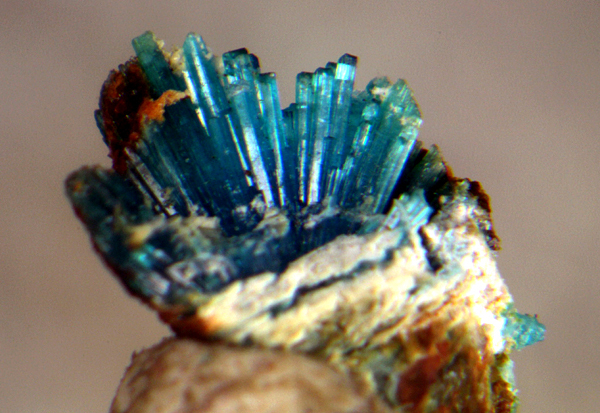 Linarite crystals in cavity. A. Tsinidis photo. 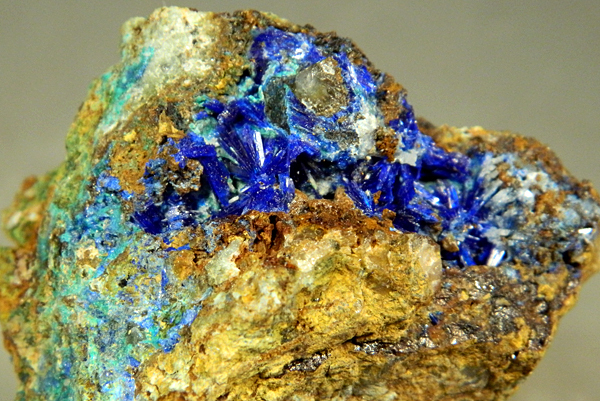 3 cm wide cavity with numerous linarite crystals. A. Tsinidis photo. 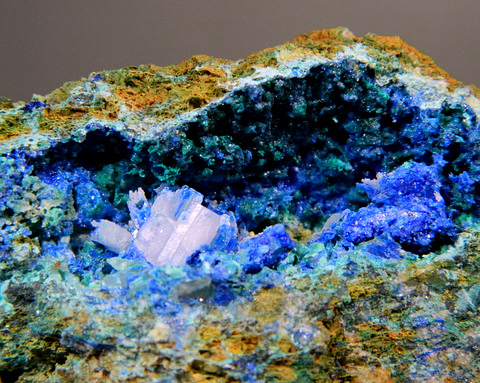 Linarite with cerussite. A. Tsinidis photo. 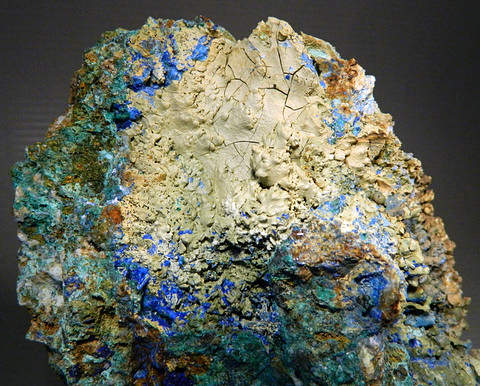 Specimen with two cavities, one with linarite and another with cerussite, allophane and brochantite. A. Tsinidis photo. 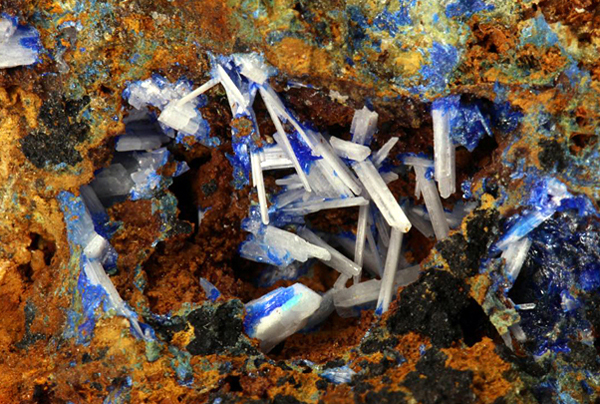 Cerussite crystals coated with linarite. G. Bijak photo. 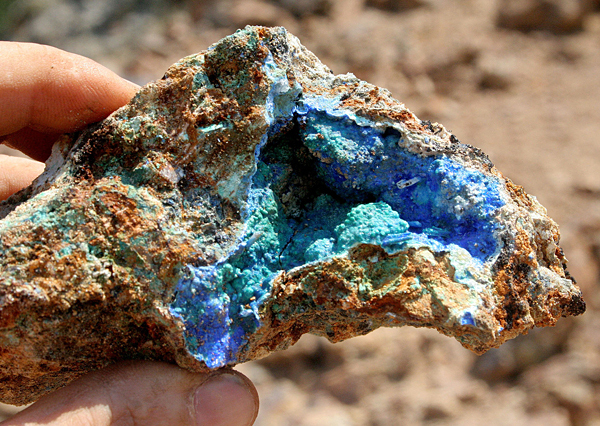 Electric blue linarite in the cavity. G. Bijak photo. 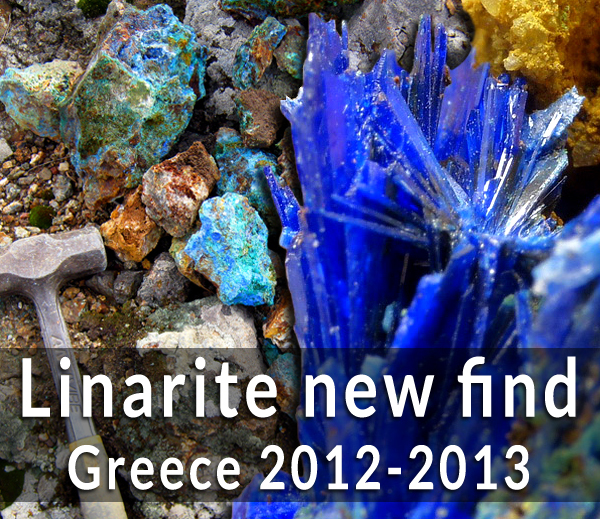 One of two best known linarite specimens not only from the Kirki area but from the whole Greece! Crystals over 1 cm long. Ch. Wright specimen. G. Bijak photo. 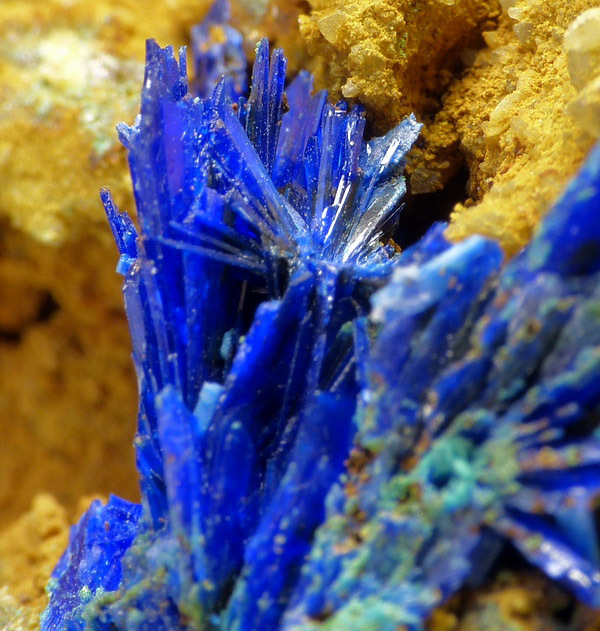 Close-up of one of two best linarite specimens known not only from the Kirki area but from the whole Greece! Crystals over 1 cm long. Ch. Wright specimen. G. Bijak photo. Second of two best specimens! Crystals over 1 cm long. G. Bijak photo. 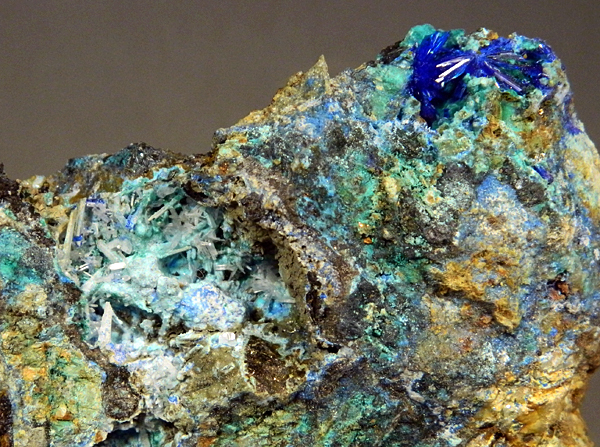 One of the best linarite specimens known from Greece! Crystals over 1 cm long. G. Bijak photo. 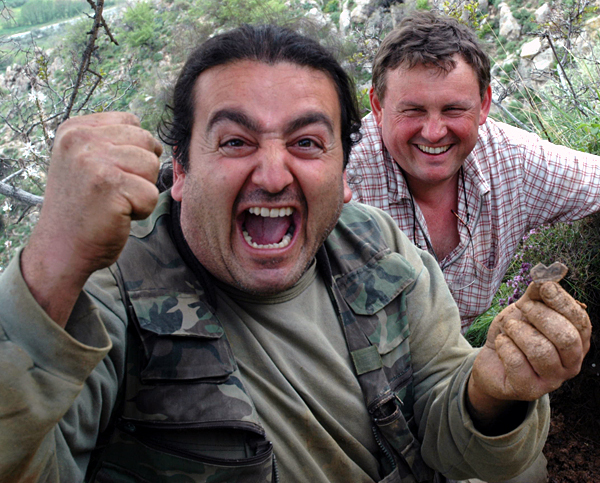 Anastasios Tsinidis - author of the article and finder of the best Greece linarites - here digging quartz specimens. A. Akhavan photo.